The investor has also agreed to fund 50% of the payments under the EPC contract (engineering, procurement and construction) awarded to the Danish developer. In total, GIP will invest approximately £4.46 billion in what is set to be the world's largest offshore wind farm when commissioned in 2020, Ørsted stated. The sum is to be paid between 2018 and 2020. The firm will partly finance its acquisition of half of the project off the north-east coast of England, using a multi-tranche financing package of more than £3.5 billion. The package contains a mixture of investment grade-rated project bonds issued to "a consortium of blue chip institutional debt investors with strong UK presence", commercial bank loans and mezzanine debt from Danish pension fund Pension Forsikringsaktieselskab (PFA). PFA is also a minority sharegolder in Ørsted's Walney Extension project in the Irish Sea. Denmark’s Export Credit Agency, EKF, guaranteed some tranches of the financing, the developer added. Ørsted stated its financial guidance for 2018 remains unchanged. It expects full-year earnings before interest, tax, depreciation and amortisation (Ebitda) to be "towards the upper end of the guidance range" of DKK 12.5-13.5 billion (€1.67-1.8 billion), and gross investments of DKK 16-18 billion (€2.14-2.41 billion). The transaction is subject to certain regulatory approvals, including from relevant competition authorities, and is expected to close in the fourth quarter of 2018. It is the latest in a series of investments in wind power made by GIP. The investment firm also holds 50% ownership shares of two of Ørsted’s German offshore wind farms, the 345MW Gode Wind I project and 450MW Borkum Riffgrund 2 projects. GIP has also acquired NRG Energy’s renewable energy business plus Singaporean compay Equis Energy and its 11GW-plus renewables portfolio. 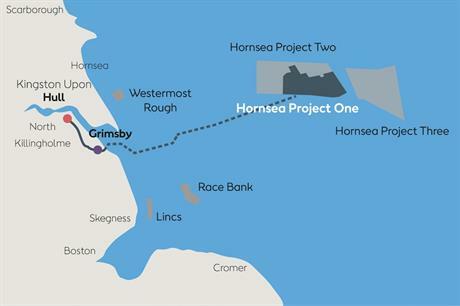 Hornsea Project One will consist of 174 of Siemens Gamesa’s SG-7.0-154 turbines and is being built 120km from the UK’s east coast. Offshore construction started in Janaury 2018 and it is expected to be fully commissioned in 2020. The project was awarded a contract for difference (CfD) in April 2014. Ørsted acquired the project from SMart Wind, a joint venture (JV) of Mainstream Renewable Power and Siemens Financial Services in February 2015.